One of my responsibilities as a part-time reference librarian at the Maryland State Law Library is to maintain the display cases in our lobby. Highlighting items we have in our collection is the goal. Not surprisingly, The War of 1812 is our current display. When I began planning the display, my thoughts turned to The National Anthem and Francis Scott Key, Dolly Madison saving the huge painting of George Washington while fleeing the burning White House, and the Indian leader Tecumseh. Then my mind went blank and I realized how little I actually knew about the War of 1812. Creating this display turned out to be a fascinating project. For those of you who slept through American History in high school like I did, here is a brief synopsis and highlights of the war. The War of 1812 was a conflict between the United States and the British Empire that began in 1812 and lasted until early 1815. A declaration of war was requested by President James Madison to protect American ships on the high seas and to stop the British from capturing U.S. sailors. U.S. ships were being stopped and searched by British and French ships, which were both fighting each other in Europe. President Madison also wanted to prevent the British from creating alliances with Native Americans on the American frontier. Americans in the West and South, who hoped to increase the size of the United States by seizing control of both Canada and Florida, influenced his decision. Critics called the War of 1812 “Mr. Madison’s War,” but others saw it as a “second war of independence,” an opportunity for Americans to protect their freedom and honor in the face of European disrespect. Dozens of battles were fought on land in Canada and in the United States, in the present-day states of Michigan, Indiana, Ohio, New York, Maryland, Louisiana, and Alabama. There were crucial naval battles on Lakes Erie and Champlain, and a wide-ranging maritime struggle with many episodes off Virginia, Massachusetts, Nova Scotia, Cuba, Ireland, the Azores, the Canaries, British Guyana, and Brazil. The United States was surprisingly successful against the great British navy, but the War of 1812 also saw American armies surrender en masse and the American capitol burned. The war eventually ended in a stalemate. The Treaty of Ghent was signed on December 24, 1814 although not ratified until after the final Battle of New Orleans in January 1815. The settlement simply ended hostilities and restored pre-war borders. The conflict served to define the nation of Canada but the British made no stipulations for the Indians. The U.S. and Canada ultimately each gained a sense of nationalism from the conflict, while the result tolled the end of Native American dreams of a separate nation. One in particular was Tecumseh. He was a Shawnee Indian who eventually became one of their greatest leaders. By the early 1800s, Tecumseh decided that the best way to stop white advancement was to form a confederacy of Indian tribes west of the Appalachian Mountains. Tecumseh believed that no single tribe owned the land and that only all tribes together could turn land over to the whites and that a united Indian front would have a better chance militarily against the Americans. During the War of 1812, Tecumseh and his followers allied themselves with the British. Tecumseh hoped that if the British won, they would return the Indians’ homeland to them. Tecumseh died at one of the most important battles of the conflict, the Battle of the Thames, in 1813. A combined English-Indian force met an American army but the British soldiers ran from the battlefield, leaving Tecumseh and his Indian followers to continue on their own. The Americans drove the Natives Americans from the field, and an American’s bullet killed Tecumseh. Tecumseh’s death signified the end of united Indian resistance against the Americans. By the beginning of 1814, Americans were growing tired of the conflict and opposition to the war was on the rise. However, on August 24, 1814 it became personal. A British force occupied Washington, D.C. and set fire to many public buildings following the American defeat at the Battle of Bladensburg. The White House, the U.S. Capitol, The Library of Congress and many other government buildings were largely destroyed. Less than a day after the attack, a hurricane that included a tornado passed through, injuring British soldiers and putting out the fires. This forced the British troops to return to their ships, many of which were badly damaged by the storm, and so the actual occupation of Washington lasted about 26 hours. The British Commander later reported that more of their soldiers were wounded and killed from the hurricane than from all the firearms the American troops could muster in their ineffectual defense of Washington. After destroying the Capitol and exhilarated with their easy victory, the British headed north to Baltimore where they hoped to strike a major blow against the demoralized Americans. However, Baltimore, being the country’s third-largest city and a vital port, had been preparing for this attack for a year. Maryland militia numbered 9,000, with every able-bodied male up to the age of 56 having been called up in its service. The Battle of Baltimore was a combined sea/land battle and was a turning point in the war. American militia who were determined to hold the line at Baltimore blocked the land assault. To reach Baltimore by water, it was necessary to capture Fort McHenry. Under the command of Major George Armistead and with 1,000 soldiers, the Fort could not be breached after a 25-hour bombardment and ultimately the British withdrew. 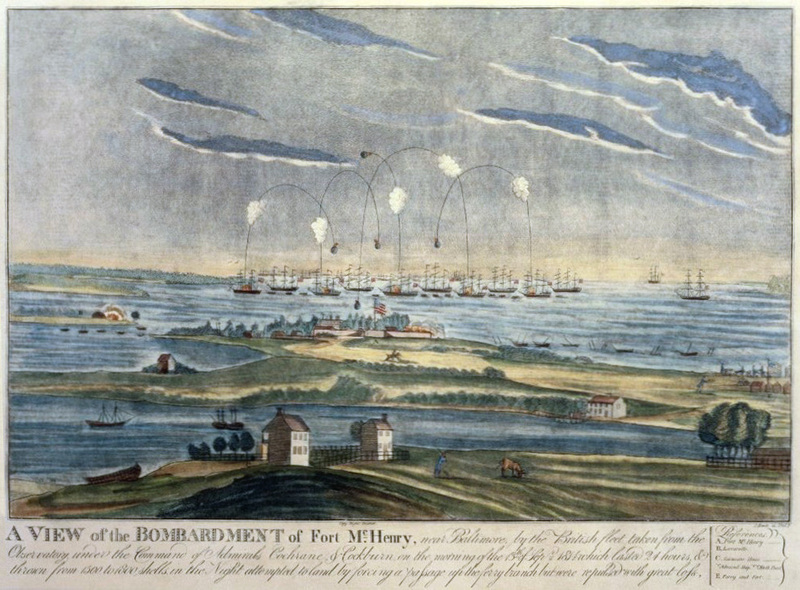 In Baltimore’s preparation for an expected attack, Fort McHenry was made ready to defend the city’s harbor. Major Armistead commissioned Mary Young Pickersgill to make two oversized American flags for the fort. The larger of the two flags would be the Great Garrison Flag, the largest battle flag ever flown at the time. The smaller of the two flags would be the Storm Flag, to be more durable and less prone to fouling in inclement weather. Mary Pickersgill stitched the flag with her daughter, two nieces, and two African American servants in six weeks. She was paid $405.90 for her work — at that time, more money than most Baltimore residents earned in a year. Contrary to popular belief, the flag did not fly during the Battle of Baltimore, but was raised after the U.S. victory, at “dawn’s early light,” to the tune of Yankee Doodle. The Flag remained with the Armistead family until 1912, when it was given to the Smithsonian. By then over 200 yards of it were cut and given away as tokens of appreciation or service, including the 15th star, which has never been located. Today, the flag measures 30 feet by 34 feet. The official name of the flag is the Star-Spangled Banner, and it is on display at Smithsonian’s National Museum of American History, where it continues to inspire generations of Americans. It was at this battle that Francis Scott Key wrote our National Anthem. When the British left Washington, they took with them an elderly and well-respected American physician prisoner, Dr. William Beanes, whom they accused of spying. Beanes was taken to the British flagship HMS Tonnant, which was anchored in Baltimore harbor. President Madison gave attorney Francis Scott Key the sanction to intervene. On September 3rd, Key and Colonel Skinner, who was experienced in negotiating prisoner exchanges, sailed for Baltimore. They reached the Tonnant under a flag of truce on the morning of the 7th. After defending Dr. Beanes by producing letters from wounded British prisoners who told how he and other American physicians had respected them and treated their wounds, the British agreed to release the three men — but only after a few days. They were placed under guard aboard the HMS Surprise. On the morning September 13th the battle began; it lasted for 25 hours. Francis Scott Key and his two American friends were transferred to their sloop behind the convoy of British warships. They could only watch helplessly from its ramparts, closely guarded by the same enemy that was simultaneously killing their countrymen. Americans took tremendous pride in their victory over the British at the Battle of Baltimore. Handbills were quickly printed and copies distributed to every man who was at Fort McHenry during the bombardment. Key’s words were first printed on September 20, 1814, in the Baltimore Patriot and Advertiser. By the end of the year, Key’s words were printed across the country as a reminder of the American victory. The poem was set to the tune of a popular British song “The Anacreontic Song” (or “To Anacreon in Heaven”), and later renamed “The Star-Spangled Banner.” The “Star Spangled Banner” became a well-known American patriotic song. It gained special significance during the Civil War, a time when many Americans turned to music to express their feelings for the flag and the ideals and values it represented. By the 1890s, the military had adopted the song for ceremonial purposes, requiring it to be played at the raising and lowering of the colors. Despite its widespread popularity, “The Star-Spangled Banner” did not become the National Anthem until 1931 When President Hoover signed it into law. This entry was posted in Featured Articles, Newsletter by LLAM News. Bookmark the permalink.